Vaccum Tray Dryer Manufacturer In India: We are the largest making “Vaccum Tray Dryer” Manufacturers from India. Vaccum Tray Dryer (VTD) is suitable for drying of thermal sensitive materials easily resolved, polymerized or deteriorated under higher temperature. Sterilization can be conducted prior to the drying process, during which no matter is allowed to enter the product. Static Vaccum Tray Dryer eliminates the configuration damage of the drying materials therefore widely used in pharmaceutical, chemicals and foodstuff etc. 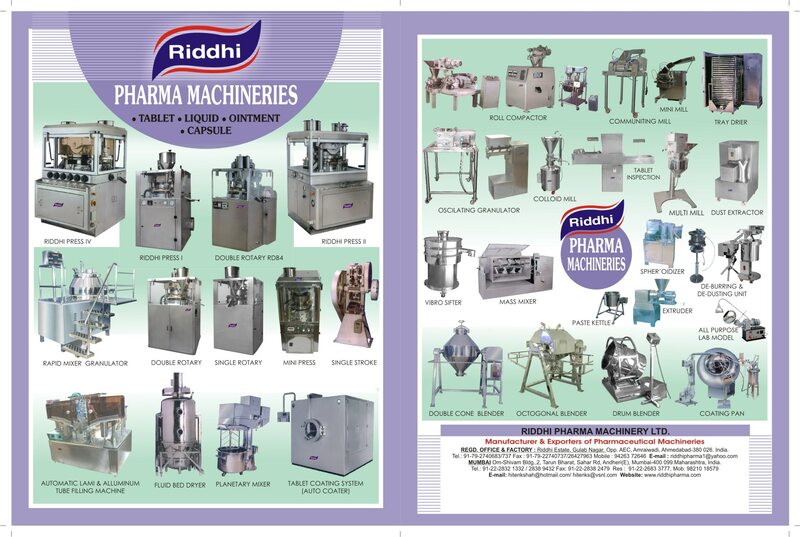 'RIDDHI' - introduces one of the finest Pharmaceutical Vaccum Tray Dryer unit providing compactness and conceptional principle of Air Fluidization for drying granules, crystalline, coarse or similar materials in Pharmaceuticals, Fine Chemicals, Dyes, Food & Allied Industries. Roller Compactor Supplier In India: We are the largest making “Rapid Compactor” Supplier from India. The Rapid Compactor machine is used for dry granulation of pharmaceutical ingredients in pharmaceutical industry, in food as well as chemical industry for densification and granulation of powder. The Rapid Compactor dry compaction of the powder between two rollers on high pressure for increased bulk density, making granules, dust free processing and reducing packing size. The material in form of powder passes through the two counter rotating rolls of roller compactor under very high pressure. As the volume decreases through the region of maximum pressure, the material is formed into a solid compact sheet or flakes of ingredients. These Rapid Compactor flakes or compact sheet of ingredients are reduced in size to obtain the desired grain size. The Rapid Compactor machine takes extra care to prevent the generation of fine during this process. Manufacturer Of Roller Compactor In India: We are the largest making “Rapid Compactor” Manufacturers from India. The Rapid Compactor machine is used for dry granulation of pharmaceutical ingredients in pharmaceutical industry, in food as well as chemical industry for densification and granulation of powder. The Rapid Compactor dry compaction of the powder between two rollers on high pressure for increased bulk density, making granules, dust free processing and reducing packing size. The material in form of powder passes through the two counter rotating rolls of roller compactor under very high pressure. As the volume decreases through the region of maximum pressure, the material is formed into a solid compact sheet or flakes of ingredients. These Rapid Compactor flakes or compact sheet of ingredients are reduced in size to obtain the desired grain size. The Rapid Compactor machine takes extra care to prevent the generation of fine during this process.